The Lego Star Wars Advent Calendar is one of the must have toys for Christmas 2015. We constantly track for stock which ensures you will be the first to know when availability is found. With the Lego Star Wars Advent Calendar every day is a treat with 24 Lego Star Wars style gifts behind the 24 daily windows to open. Together with a fold-out playmat,vehicles, starships and minifigures will keep the little ones occupied all month! We constantly check for Lego Star Wars Advent Calendar stock, so you don't have to. 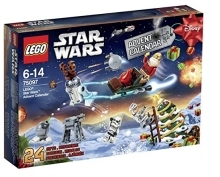 Receive email alerts when Lego Star Wars Advent Calendar online stock is found.